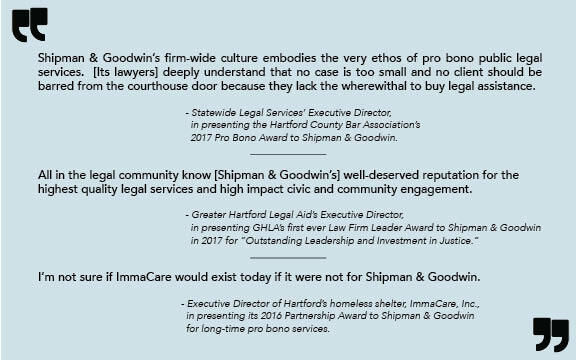 Shipman & Goodwin’s unwavering commitment to pro bono service is embodied in the time and energy we devote to delivering volunteer legal services and support to those who are poor, underrepresented, or otherwise in need. We encourage all of our lawyers at every level to use their skills and experience for the benefit of the community and to find opportunities to help those who need our skills the most. Our clients include families facing eviction, disabled veterans, abused and neglected children, immigrants escaping violence abroad, and non-profits serving the needy, the environment, and the arts. To learn more about our pro bono work, we invite you to read our 2018, 2017 and 2016 Pro Bono Newsletters.